Apr. 02, 2017, 1:45 p.m.
On April 1, Philadelphians gathered in Washington Square for the Philadelphia Pillow Phight. The annual event is part of International Pillow Fight Day. Adults and kids showed up in their pajamas with pillows in tow. At exactly 3 p.m., the fight began — and lasted over an hour. Bystanders were confused, but amused. Afterwards, people left behind their pillows as donations for the homeless. Pick-up and delivery service Got Laundry? collects, cleans and delivers them to shelters around the city. 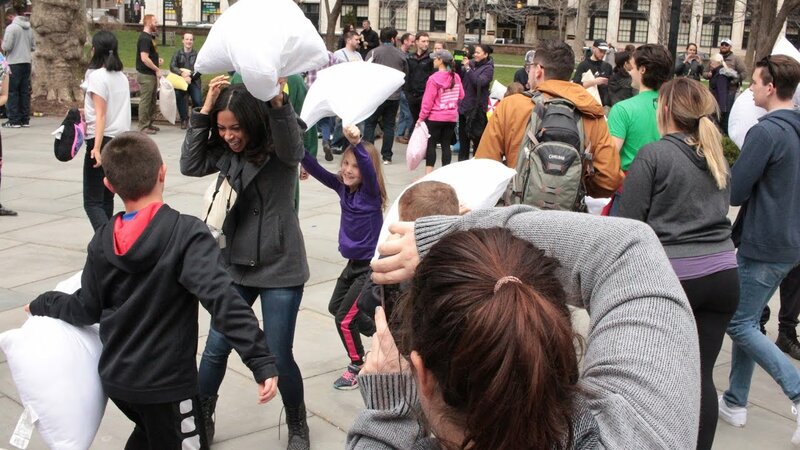 International Pillow Fight Day is the first Saturday of every April. Next year’s event falls on April 7.